The weather may not yet be ready for sleeveless shirts here in New York City, but with the roller coaster temperatures we've been having, layering is starting to become necessary. Base layers might be sleeveless, and after a warm subway ride, it might even be time to expose some arm by the time one gets indoors. Convertible bras are great for creating cross-back style straps, and there are products available that do this exact same thing to any straps, but here's a super easy and free way to quickly hide straps for a sleeveless shirt. Using a large paperclip, push both straps fully through the paperclip, and the straps are hidden! It's easiest to get them both in the paperclip if they are held together and pushed through the paperclip together. It takes seconds to do, and a large paperclip is strong enough to hold for the day, and I've never felt the sharp edges when I've worn one. Getting out of the paperclip at the end of the day may be difficult if one wants to keep the paperclip in tact, but twisting it open releases it easily. 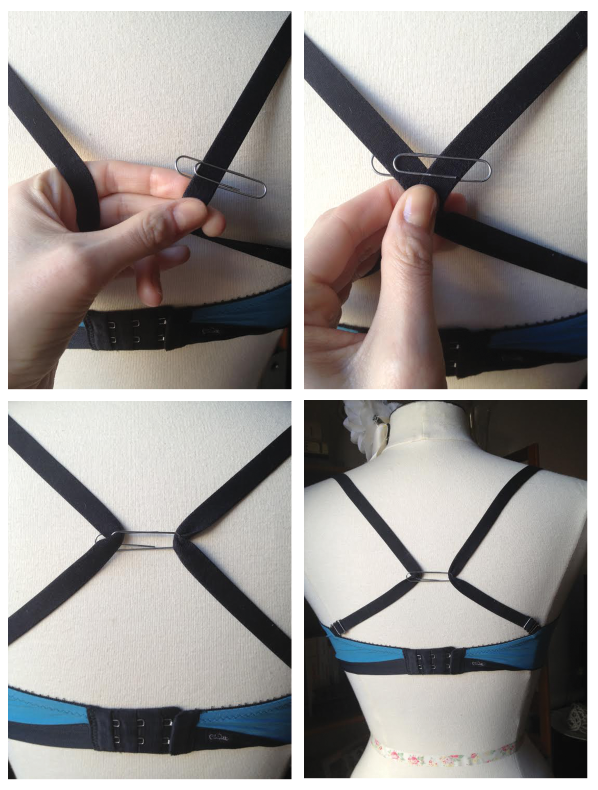 This trick has come in handy for me when I've arrived at work without realizing that my straps are showing -- super quick and easy, one never has to worry about changing bras to avoid showing straps as long as a paperclip can be found.